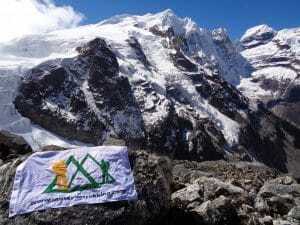 My journey to climb Mera peak in Nepal started with a trip to climb Kilimanjaro. I found Ian on a google search. 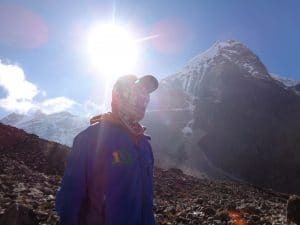 These video’s inspired me to climb Kilimanjaro. The information Ian has really helped me understand how to go about my preparation and how to be successful. A friend of mine from Colorado tried to climb Kilimanjaro in 6 days and she was much fitter than I was. She was not successful and got altitude sickness and lives at higher altitude. I really wanted to be successful so I listened to Ian’s advice and went with the 8 day climb. The best decision I made, was picking the 8 day Lemosho route. My Kilimanjaro climb was life changing and a successful one. 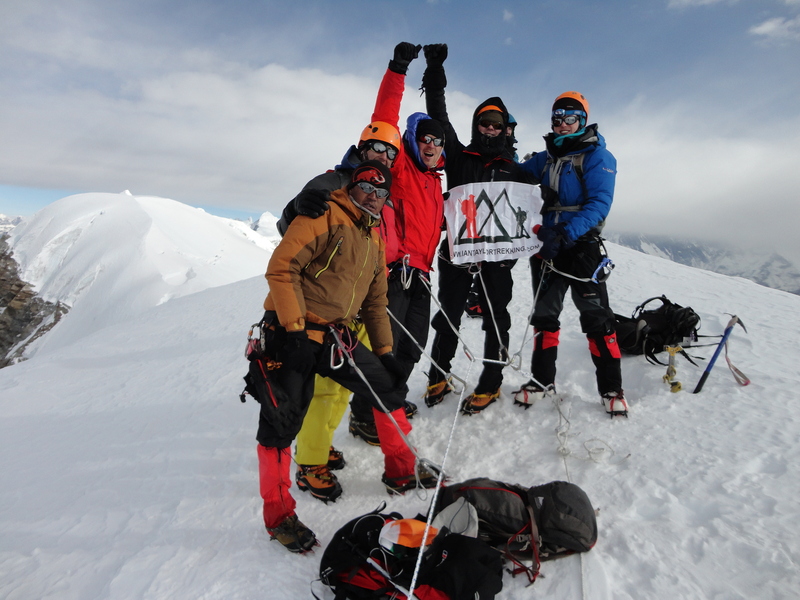 Our team of 12 all made it to the summit. A wonderful experience with a great team of people in support of our success. When I decided to go higher and visit Nepal. Mera peak became my new goal. I was excited to see more acclimatization in the schedule and Ian really had some excellent advice and training information. 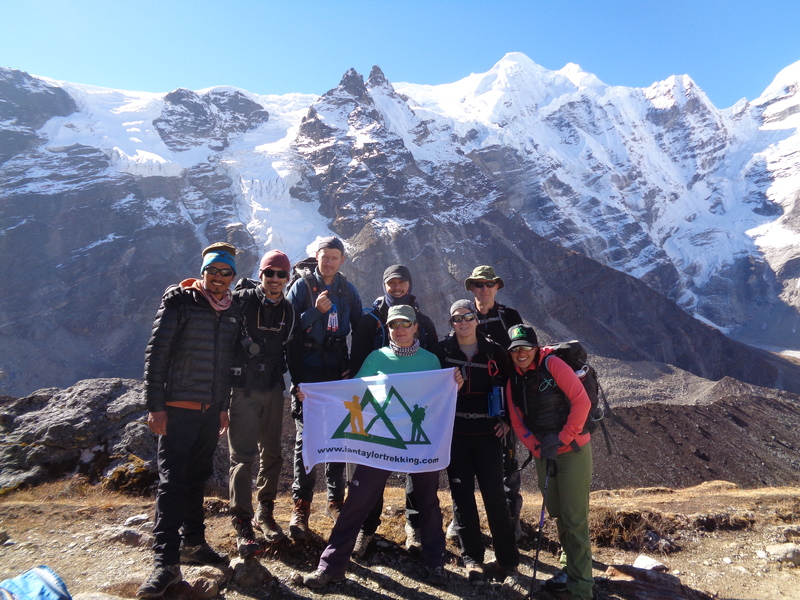 Mera peak was certainly harder than Kilimanjaro and required more endurance training and strength training. The trek in to Mera peak is hard. 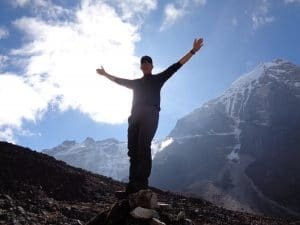 I was surprised at the amount of steps in the early part of the trek into Khote 11,800 feet, although I appreciated the acclimatization and I would really encourage everyone to follow Ian’s training advice. It really paid off. I really loved getting off the beaten path and seeing very few people on the trail. The small villages, sometimes just small groups of houses were amazing to stay at. We had fantastic weather for the first seven days and then hit with 2 days of snow, which made it slow going. Once the snow cleared the mountain scenery was out of this world. We now had an easier run in Khare 16,076 feet. We spent 3 nights in Khare. We spent the first day getting all climbing gear sorted and doing some abseiling training, jumar training and becoming more comfortable with the safety equipment. The following day we took an acclimatization hike to to 17,550 feet and returned to Khare. Everyone was feeling good. After 3 nights in Khare we moved up onto Mera peak and positioned ourselves at base camp 17,500 feet just off the eastern side of the glacier. We all slept well and everyone was really confident in moving higher. After the tents dried out we all rigged up and started the ascent to high camp at 19,000 feet. 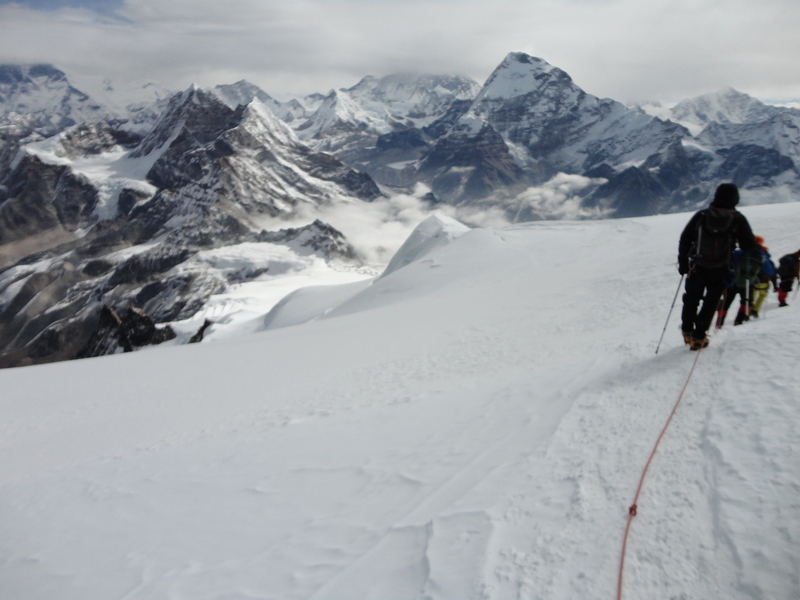 This slow transition from khare to base camp and onto high camp was perfect. It actually got very warm on the glacier as we moved up to high camp. 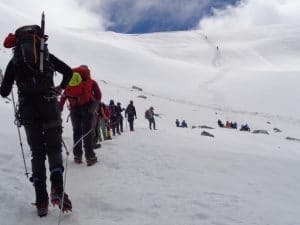 We arrived into high camp at 12pm as tents were being set up so we had to get in, rest organize ourselves for the summit attempt that was coming in 14 hours. Resting, hydrating was the name of the game. Some people had slight headaches but everyone did as instructed and prepared for the day we had all been waiting for. At 12:30am we got up and started drinking a liter of water and then got nalgene’s fulled for the summit climb. We eat and prepared for the top. At 2am we got out of the tent, we roped up and starting walking higher. I was really nervous, excited and ready for the job at hand. We moved slowly upward. 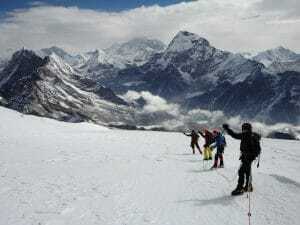 The gradient was a little steeper than the day before and we had to take our time as we moved slowly up the upper slopes of Mera peak. Once we were moving for a couple of hours I was really excited about how I was performing. I focused on each foot placement, deep breathing through my nose and tried to stay present at all times. I found myself performing great and really didn’t struggle as much as I thought I would. It was easier than the Kilimanjaro summit night. As light came on the horizon the mountain scenery was like nothing I have ever seen before. I was truly amazing. As we crested a turn in the route we moved in a more easterly direction and I could see Mt. Everest off in the distance to the right and had my eyes fixed on the amazing view. The view was hypnotic still can’t get it out of my head. Not that I want to. I could hear people saying wow and keep glancing up at the view. It was incredible. As more and more light came, we could see the summit of the mountain and it was so close. The top was right there, we just had to make a few moves up a steep slope and then the short jumar onto the summit. 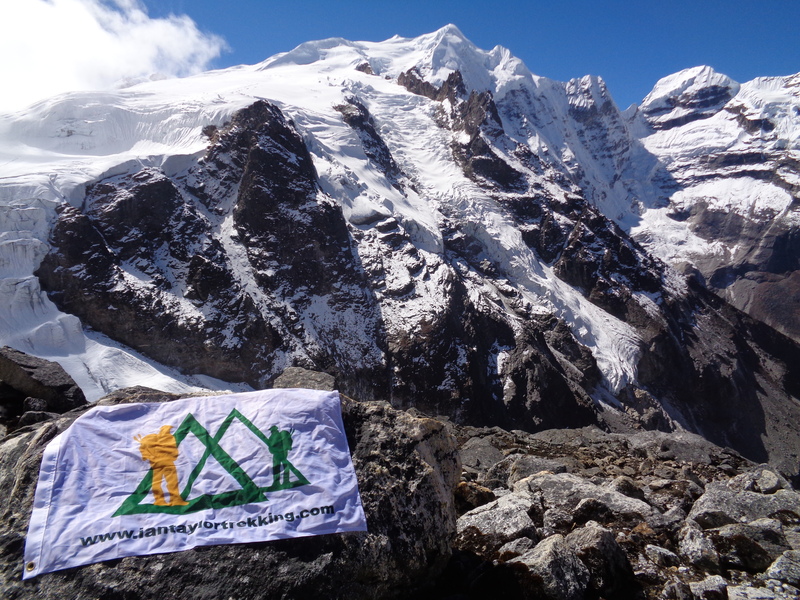 I was there 21,246 feet, high in the Himalaya’s a dream come true. The greatest view and experience of my life to date. I cried as I knew I would. I was over come with emotion as I reached the top. It was shorter 2 hours 30 mins to reach the high camp. 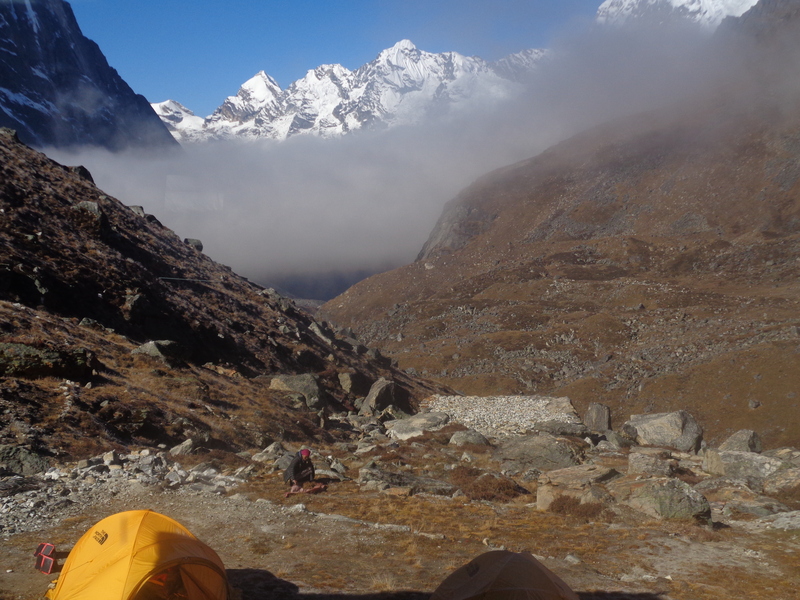 We rested for an hour, packed our bags and made our way back to Khare where we would sleep for the night. We had a great celebration and danced and partied for a few hours. 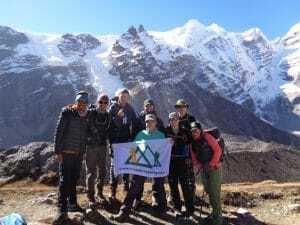 We still had more to do and we rested up as we had to walk back to Khote, and then two days back up over a high pass before making it back into Lukla for a welcome shower. A great experience, I would not have been able to achieve if I had not picked Ian’s itinerary for both climbs. I have to decide which adventure is next, it will be with Ian Taylor Trekking. Thank you all for your support, experience and expertise.